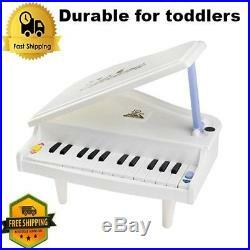 Toddler Toys For Boys Learning Educational Piano Toddler Play Center Activity. Piano Keyboard Toy 14 Keys Electronic Musical Multifunctional Instruments Girls Princess Toys for Kids over 3 Years. 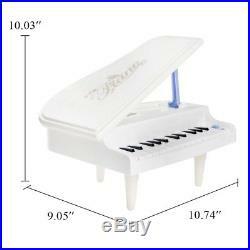 A piano toy contains: 1 x piano frame (with 14 white keys to play and 10 black keys for decoration) 1x attached stand 3 x piano stands Features: 1. When you turn on the piano toy , it will light up and slowly start changing colors. 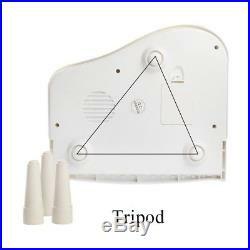 The toy has 2 modes, one is a demo mode, and the other for selecting and playing different tunes. If you turn the piano to demo mode and then press the white keys , it will play the note with” Do Re Mi Fa So La Ti Do”, and when you turn the button to the other side and then press a key, it will start playing a nursery rhyme. 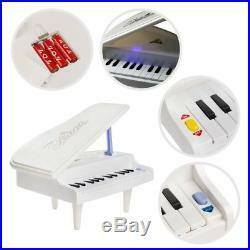 Electric piano music toy, an ideal gift for kids age 3 and up. 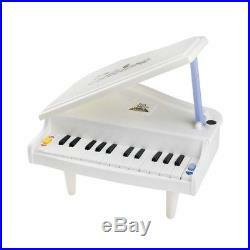 Kids can play songs that they like by playing little piano. Warning: Not suitable for kids under 3 years old. 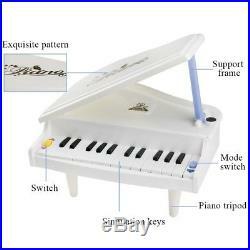 · Excellent Piano Toy – Excellent piano keyboard with 14 white keys, 10 black keys, demo songs and colorful flashing LED lights. · Dual Mode – Kids can play the keyboard and create beautiful song, also can enjoy the demo music song, provides hours of fun. · P ortable Design – With a foldable attached stand and 3 detachable bottom stands, easy to storage and pack away, suitable to play indoor and ourdoor. · Ideal Gift for Kids – Musical educational toys, help to develop children’s musical talent at an early age, ideal as birthday and Christmas present. · More Details – Notice:CHOKING HAZARD. Not suitable for kids under 3 years old. 3 AA batteries required (Not included) “Length: 11.02 inch Height: 9.45 inch Width: 3.15 inch Weight: 1.25 pounds”. We stand behind our products. Our stock all ships from our US-based warehouses. Most orders are in transit for two days but some may take longer. Ue to factors beyond our control. It says it all. Thank you for shopping with us! Toddler Toys For Boys Learning Educational Piano Toddler Play Center Activity Excellent Piano Toy – Excellent piano keyboard with 14 white keys, 10 black keys, demo songs and colorful flashing LED lights. Dual Mode – Kids can play the keyboard and create beautiful song, also can enjoy the demo music song, provides hours of fun. Portable Design – With a foldable attached stand and 3 detachable bottom stands, easy to storage and pack away, suitable to play indoor and ourdoor. Ideal Gift for Kids – Musical educational toys, help to develop children’s musical talent at an early age, ideal as birthday and Christmas present. More Details – Notice:CHOKING HAZARD. 3 AA batteries required (Not included) Piano Keyboar. 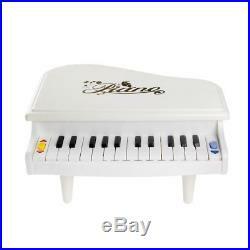 The item “Piano Keyboard toy for toddlers girl boy kids age 3 4 5 6 years old Instruments” is in sale since Monday, December 4, 2017. 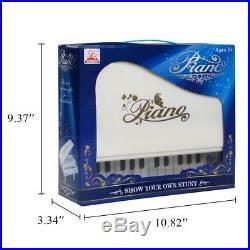 This item is in the category “Toys & Hobbies\Educational\Music & Art”. The seller is “*six_stars*” and is located in Dallas, Texas. This item can be shipped to United States.